A reflection for the 3rd Sunday of Easter, Year A. The readings are Acts 2:14, 22-33, Psalm 16, 1 Peter 1:17-21 and Luke 24:13-35. Every time I do a baptism, I use one of my favourite Gospel passages: From Matthew 28, 18-20: “All authority in heaven and on earth has been given to me. Go, therefore and make disciples of all nations, baptizing them in the name of the Father and of the Son and of the Holy Spirit, and teaching them to obey everything I have commanded you. And remember I am with you always, to the end if time.” I especially love the last line, “I am with you always, to the end of the age.” He says “remember” because that’s the part we forget. And I don’t know about you, but I know why I forget. I’ve never see God. I’ve never heard the voice of Jesus. He’s never spoken to me in a dream. The disciples knew Jesus was with them because he was with them. Mary knew what was going to happen because an angel appeared to her and told her. But what do we have? A promise: Remember, I am with you always, until the end of time. And today’s Gospel reading, the Road to Emmaus is probably the best example of this transition. The disciples – and we may think that it was two guys, but in the Gospel of John we know that one of the three women at the foot of the Cross was Mary the wife of Clopas. And we know that one of these disciples on the road to Emmaus was Clopas; maybe the two disciples were Clopas and his wife Mary. These disciples, whoever they were, were leaving Jerusalem. They are devastated. They are more than sad. It’s not like a friend just died. It’s not even like a friend was just killed. But this was all their hopes and dreams: shattered. And Jesus wasn’t just killed. He was crucified. That’s the most horrible and shameful death! These two disciples have lost everything. They are lost. And sometimes that’s where we are. That’s sometimes who we are when we come to Mass on Sunday. We come here and bring all our failures, our mistakes, our despair and doubt, our fear and sadness. That’s why the first thing we do at Mass is bring all those failures – the lows of the week – into prayer. We ask for forgiveness and we ask for Mercy. And right off the bat, Jesus is walking with us, but we don’t recognize Him because we are so consumed by our despair, our fear, our doubts and our sadness. Still, Jesus listens – He meets us where we are. That’s why the very next thing after the Rite of Reconciliation at Mass is a prayer. When the priest says, “Let us pray” and there’s that brief moment of silence – that’s for you to bring to prayer all those things you brought to Mass. Then the priest gathers all our prayers and offers them up using the words of the opening prayer for that day. It’s important that we make that Opening Prayer, our prayer because Jesus is already walking with us and listening. And then Jesus responds. He responds to us using Scripture. This is how Jesus responded to the despair of the disciples on the road to Emmaus. He uses Scripture and then He explains it. And not to explain nice teachings, but to explain Himself and his death and resurrection. That’s what it’s about. If you look at the first reading today, that’s exactly the same thing Peter does. That speech is the first homily, if you will, after Pentecost. The first homily of the Church. And Peter doesn’t say “we follow Jesus because He said lots of things that made sense, like turn the other cheek and love your neighbour and feed the hungry.” Instead he says, “Jesus was sent by God to do wonders and then evil men killed Him but He would not be bound by death and God raised Him up.” And he uses Scriptures to explain it – He uses Psalm 16, which is the Psalm for today to show that this was the plan all along; that death could not hold him. He would not see corruption and death. And then they go. They go and announce the Gospel of the Lord. They go back in the middle of the night, the seven miles, back to Jerusalem. They don’t do the dishes or clean up. They go. That’s what happens after we meet Christ. That’s the joy of the Gospel; the Good News of the Resurrection: That Jesus takes all our fears, our despair, our loneliness, our doubt, our sinfulness and He transforms it and He does it here, in the opening up of the Scriptures and in the breaking of the Bread. Are your hearts burning? Are you recognizing Him? Are you wanting to say, “stay with us Lord for it is late”. Jesus is here and it is He who listens to us and opens up the Scriptures for us. It is He who teaches us and it is He who takes the bread, blesses it, breaks it and gives it to us. He is with us always, until the end of time. Where were you at the beginning of Mass today? Where are you now? After Mass, where did you go? Jesus Christ is alive. He has truly been raised and He is with us always until the end of time! Image: This original icon is by Sr. Marie-Paul Farran, O.S.B., of the cloistered Benedictine Monastery on the Mount of Olives, Jerusalem, Israel. It portrays Clopas’ companion on the road to Emmaus, as a woman; perhaps, his wife, Mary. Sr. Marie-Paul’s community is a very poor community located in the Arab part of the city. One of their main sources of support is the sale of Sister Marie-Paul’s icons, both originals and reproductions. 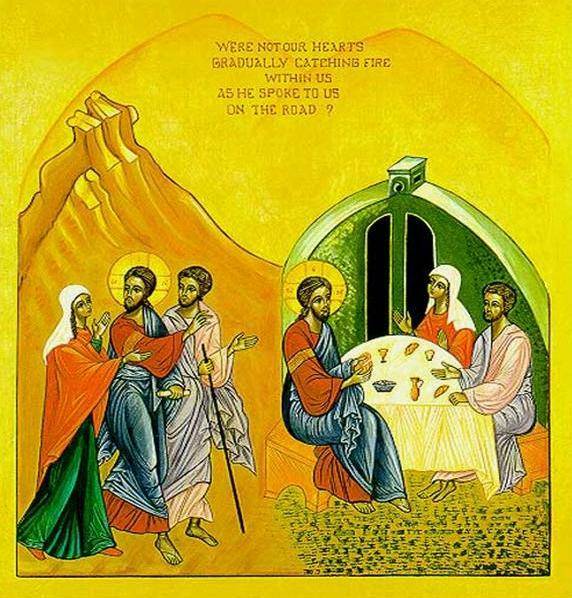 The Emmaus icon was commissioned in 1990 by Fr. Thomas Rosica, CSB. The original icon is in Toronto at Salt + Light Television. Reproductions of the icon are available through the Printery House in Conception, Missouri. Photo of original icon by Salt and Light Catholic Media Foundation. « How Do We Know the Way?